LBJ Night Before JFK Assassination: "Those SOB's Will Never Embarrass Me Again"
Though Brown first went public on her 21-year relationship with Johnson in the early 80's, to this day her shocking revelations about how he had told her the Kennedy's "would never embarrass me again" the night before the assassination are often ignored by the media who prefer to keep the debate focused on issues which can't definitively be proven either way (or at least can be spinned and whitewashed). "They had this lodge....outside of Dallas and they would meet there....he chose different people to do certain things for him and I'm sure it went on about two years prior to the assassination of John Kennedy." Watch a clip of Robert Gaylon Ross' eye-opening interview with Madeleine Duncan Brown. 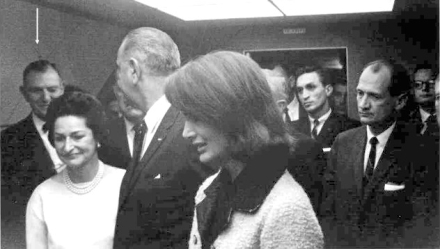 The Most Revealing Wink Of The 20th Century: Congressman Albert Thomas winks back at a quickly-smiling LBJ as he is being sworn in to be the next President of the United States on Air Force One while the grief-stricken Jackie Kennedy stands next to him. Johnson was still irate when he called Madeleine Brown the morning of the assassination, telling her the Irish mafia (meaning the Kennedy family) would never embarrass him again. 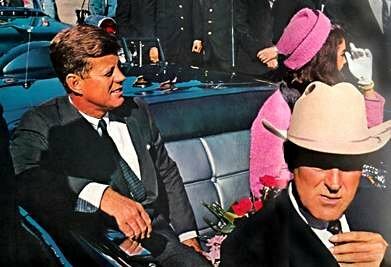 Brown was in Dallas in the day of the assassination but just as the parade for Kennedy was beginning she left and began driving towards Austin, first stopping off to have a haircut. Upon entering a hair salon she saw the news that Kennedy had been shot and immediately thought to call Lou Sterrett , who was an Austin media mogul. "I said my God what has happened Lou?" "And he said 'well they just shot that S.O.B'"
Having had her own (and LBJ's illegitimate) son and nanny disappeared by Johnson's hitmen after the assassination, and upon hearing of the strange deaths of many other people connected to the events in Dealy Plaza, Brown felt that she was safer out in the light and decided to let the world hear her story. It's a story that simply hasn't got enough attention, besides a 2003 book written by Barr McClellan, father of White House press secretary Scott McClellan. Hopefully this article and the video clip contained therein will help to bring more attention to perhaps the biggest smoking gun proving that the assassination of JFK was an inside job planned from the very top years in advance. If they had the gall to blow the President's head off in broad daylight with the world's media watching over 40 years ago - what would stop the same lineage of criminals from carrying out 9/11? This is Robert Gaylon Ross' interview with Lyndon Johnson�s mistress, Madeleine Duncan Brown. She claims that LBJ told her that he had John F. Kennedy killed. Video courtesy of Prisonplanet.tv via Google Video.